As thousands of beachgoers flock to North Carolina’s surf zone this summer, they can thank the National Weather Service and lifeguards for their ongoing efforts to improve rip current outlooks. Those efforts join North Carolina Sea Grant’s beach safety outreach, including coordinating printing and distribution of Break the Grip of the Rip signs that are found up and down the state’s 300 miles of ocean coastline. The signs and related materials are part of a national partnership that includes the national Sea Grant network, weather service and other National Oceanic and Atmospheric Administration offices, along with the U.S. Lifesaving Association, the National Park Service and beach communities. “Rip currents are the lion’s share of ocean rescues in this area,” notes Dave Elder, who leads ocean safety efforts in Kill Devil Hills on the Outer Banks. In addition to reporting conditions to the local weather office, Elder and his team are among lifeguards and forecasters around the nation who now provide daily data to a NOAA database. Elder has been an active researcher as well, having worked with Greg Dusek of the University of North Carolina at Chapel Hill and partners at the U.S. Army Corps of Engineers over a number of years to catalog surf zone conditions and resulting rescues. The group uses that data to ground truth — and improve — rip current outlooks. Dusek kept his focus on rip currents after he moved from doctoral studies to join the NOAA Meteorological Development Laboratory, where he analyzes national reports. “Now we are feeding data to Greg at NOAA,” Elder explains. For example, lifeguards often report that conditions that bring strong shorebreak waves at high tide also bring rip currents at low tide, a finding that Dusek, Elder and colleagues noted in research journals. Local and national lifeguard reports also describe longshore currents, surf height and rip current strength. Their rescue data shows a daily total and notes how many were related to rip currents. Coastal weather forecast offices issue rip current outlooks at 4 p.m. for the following day, with an update at 4 a.m. Days with high threats often draw news reports by broadcast, online and print media. “Based on any new input from the guards that may differ from the going forecast, the 11 a.m. update may be modified based on the lifeguard input,” adds Tom Lonka of the NWS office at Newport/Morehead City. A similar process is followed by the Wilmington forecast office, which includes a portion of South Carolina, and the Wakefield, Va., office that covers the Currituck County beaches. Steve Pfaff of the Wilmington NWS office has compiled a listing of rip current-related drownings at beaches in North and South Carolina, showing more than 80 deaths since 2000. Of that total, a clear majority of victims were male, with the largest category men age 41 to 50. Pfaff has suggested additional research could confirm how many of those were actually attempting to rescue family and friends. Cape Hatteras National Seashore provides rip current information at its three lifeguarded beaches. Park staff also give safety information through programs at the visitors’ centers and lighthouses. “We always encourage people to swim near lifeguards,” Chief Ranger Paul Stevens explains. Spencer Rogers, North Carolina Sea Grant’s coastal erosion specialist, has focused on rip current safety for more than 30 years. “If we save one life, it is worth it,” notes Rogers, who was the keynote speaker at an international rip current symposium in 2012. Daily threats of rip currents are included in surf zone reports on www.weather.gov. 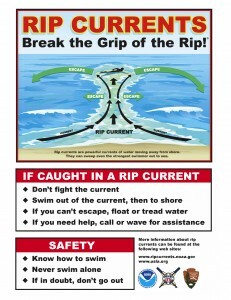 For more information about rip currents, shorebreaks and longshore currents, go to www.ripcurrents.noaa.gov. This article was published in the Summer 2013 issue of Coastwatch.